Wilma and Roswell Messing, Jr. 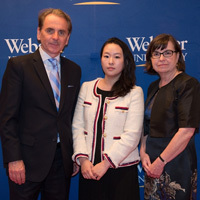 Faculty Award recipient Seoyeon (Celine) Hong with Provost Julian Schuster and Vice Provost Nancy Hellerud. All five recipients were honored at the annual commencement dinner and on other occasions throughout the weekend. Read about the four Kemper Award recipients here. Since 1977, the Wilma and Roswell Messing Jr. Faculty Award has been presented to a full-time faculty member for a summer activity that strengthens his or her curriculum and that improves the teaching/learning experience. The award provides the resources for a Webster University faculty member to complete international research projects and infuse the results of their studies into their curricula and teaching. Faculty proposals are peer-reviewed by an appointed University committee. This year’s recipient is Seoyeon (Celine) Hong, assistant professor in the Department of Communications and Journalism in the School of Communications. Hong, who teaches courses in media research and social media, will attend the 66th International Communication Association (ICA) conference held in Japan, June 9-13 of this year. ICA is the largest academic association for scholars interested in the study, teaching and application of all aspects of human and mediated communication, with more than 4,500 members in 80 countries.